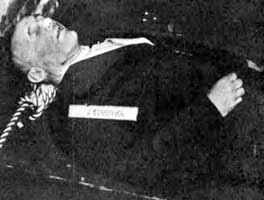 Julius Streicher, Hitler's favorite "journalist," after dancing the executioner's jig at Nuremberg. The editorial board is composed of 19 journalists with wide-ranging areas of expertise. Their primary responsibility is to write The Times’s editorials, which represent the voice of the board, its editor and the publisher. The board is part of The Times’s editorial department, which is operated separately from The Times’s newsroom, and includes the Letters to the Editor and Op-Ed sections. Andrew Rosenthal, the editorial page editor of The New York Times, is in charge of the paper's opinion pages, both in the newspaper and online. He oversees the editorial board, the Letters and Op-Ed departments, as well as the Editorial and Op-Ed sections of NYTimes.com. The editorial department of the paper is completely separate from the news operations and Mr. Rosenthal answers directly to the publisher, Arthur Sulzberger Jr. He is assisted by Deputy Editorial Page Editors Terry Tang, for the editorial page, and Trish Hall, for the Op-Ed Page, and by Tom Feyer, the Letters editor. Under his direction, the 18 members of the board prepare the paper's editorials. The board holds regular meetings to discuss current issues. The editorials are written by individual board members in consultation with their colleagues, and are edited by Mr. Rosenthal and Ms. Tang. . . Trials for crimes against humanity should only be held in Nuremburg in keeping with tradition. Oops....except when they're on one. I will copy and save this list with my others, conveniently provided by The Sipsey Street Irregulars. I'll have paper copies in my pocket for when the SHTF. What ever happened to Sgt. "Short Rope Joe," the "Hangman" at the War Crimes trials!!???? Julie' sure got to dance a long jig, a whole 10 minutes after he dropped!! Joe had to "Do Something" under the curtain to "End It!!" Interesting that you bring up Julius in reference to current "News Print Rhetoric!!" "19!!!" journalists on the "Board" WOW!! Sgt. Joe will have a Chore!!! "So Help Us GOD! !," the last 4 words spoke to Congress by FDR in his Speech on 08DEC1941!!" Drop the pretense. Everyone knows this is code for your deathlist for when the word is given, or for now, for the inevitable fraction of crazy followers. You belong on a terror watchlist. Put me on your deathlist too. I too am Spartacus. But if you think that you are not already slated for death (or that failing to disclose your name along with your bold declaration means anything at all except that you are a coward), then you really don't understand what is going on here. In a few years, the only people still alive in this country will be those who held defense of the Constitution to be sacred and were willing to kill to defend it along with all else they held sacred. Those who were not willing to kill, or were willing to kill to overthrow the Constitution, will be dead. We don't really need a list. That's just how things are going to go. When the left is making it clear that they plan to either implement democide, or kick off a civil war, what do you expect people to do? I'm on a list because I belong to civil liberties organizations, I'm on a list because I've bought ammunition with my credit cards, I'm on a list because I've legally bought firearms from FFLs. Are you on a list because you advocate my murder by law enforcement?